As soon as you have a ring on your finger, it’s amazing how quickly people move from exclamations of joy about spending the rest of your life with your favorite person onto the details of the upcoming celebration. It’s easy to get caught up in all of the hullabaloo. But if you’re planning to walk down the aisle in style while adhering to a budget, the process of wedding planning can be more stressful than joyful. I’m here to help, with a list of 101 unique ways to save money on your wedding — without anyone realizing you cut some corners or skipped a few traditions. Don’t try to use more than 10 or 15 of these tips on any one wedding celebration, but see whether any of these ideas feel right for you. No one’s going to doubt your love for one another because you don’t have fancy table runners or cute favors. Ready to create a beautiful celebration of your joy on any budget? Popping the question? Spring for a high-quality diamond. She also noted that the tiny pave-set diamonds adorning many rings don’t have anywhere near the value of the main diamond. Here’s our beginner’s guide to buying an engagement ring without going broke. Diamonds not your style? Fret not. You are free to profess your love by displaying a stone of your choice, whether it be pearl or peridot. If you need a little nontraditional inspiration, check out Etsy’s wedding categories. You may find handmade jewelry you love for a price that’s perfect. This tip takes mutual agreement, but it can help you save big on an engagement ring or wedding bands. Ask to take a look at a jeweler’s faux offerings, recommended Melissa Massello of Shoestring Magazine. “Time your wedding away from a full meal if you want to save on catering costs,” recommended April Masini of AskApril.com. Her top pick: a 2 p.m. champagne and cake reception. Get married during the holidays — your friends and family will already be home! “Most venues are beautifully decorated, and you’ll have to put less money into making the place look spectacular,” said wedding planner Amy McNall of Unmistakably You. One small warning: some venues charge a premium for booking during the high Christmas-party season, so make sure to ask around. “Consider a bed and breakfast, a public park or an art gallery for your reception,” said Danielle Farrell of Michigan’s Betty Brigade. When viewing venues, take note of their furniture and tabletop styles, reminded event planner Sacha Patires. If the venue matches your personal style, you could save a bundle that you would have otherwise spent on rentals. The Wedding Wagon in Las Vegas will come to you. All you need is $129 to seal the deal with a witness and photos. On the East Coast, Washington, D.C. business Pop Wed Co. offers chic elopement services (they even take care of the paperwork!) for $2500. If there’s a similar service near you, a unique package could solve most of your planning problems before they even crop up. “Most venues offer ‘nicer’ things at a markup that you will get cheaper from the vendors,” bride Breanne W. said. When she considered a package from the venue for her Pennsylvania wedding, she contacted the listed baker directly — and saved $300 on her cake by doing so. Got a recommendation from a friend? Maybe they had a great experience with a vendor and you’re excited to consider that florist or baker as well. When you contact a vendor, make sure to mention the friend who referred you. There may be a referral discount (or a bonus for your friend!). Wedding planners know how to work with budgets of all sizes, and will go to bat for you over contracts and negotiations. Not sure if you can afford a planner for the entire planning process? Many offer supplemental help by the hour or day — just get in touch with them to ask! If you’re getting married at a church where you’re a member, call on its social groups. These groups may ask for a small donation in exchange for their members’ time. “Use vendors that do more than one thing,” said wedding planner McNall. Think about a florist who also rents linens, or a wedding planner who offers decor installation. Yes, I’m serious. Ask your vendors if you can advertise their services at your celebration in exchange for a reduced rate. Writer Hamm explained how to do it: Simply put a card at each place setting that lists the businesses that helped pull off your big day. Don’t forget their contact information! “This tends to be very effective advertising,” Hamm noted. Word-of-mouth is powerful advertising indeed, especially if some of your guests are planning their own upcoming weddings. Skip clergy or justice of the peace fees by having a friend officiate. “Usually there’s no fee to register in your state and getting ordained online is quite inexpensive,” said Kelly R.
Just make sure your selected officiant is comfortable with public speaking! And do treat them to a kind gift for their services. “You’ll have to give a guaranteed number of guests — especially if it’s a seated meal,” warned Teddy Lenderman, author of The Complete Idiot’s Guide to the Perfect Wedding. If you have fewer guests than the guaranteed number, you’ll be paying for empty seats. “The best way to save money on a wedding is to cut the guest list, hands down!” wrote wedding and event planner Danielle Rothweiler. How do you decide who makes the cut? When you plan your budget, don’t forget to factor in gratuities. Some of these will be spelled out in your contracts, like that of your venue or caterer. But don’t forget those smaller gratuities. Getting your hair done at the salon? You’ll be tipping. Getting chauffeured for the day? There’s another tip. U.S. News has a tipping guide that can help you work gratuities into your budget. Cutting these early notices could save you $100 or more — and that’s before the cost of postage. Calligraphy is on trend, but hand-lettered envelopes can cost $3 each! Instead, solicit your wedding party or family members to help you address invitations. Remember, the envelope will end up in the trash, but your invitation will likely get prime real estate on someone’s fridge. It makes sense to save money on the piece that will go straight into the recycling bin. Got design chops and want to craft your own invites? “Finding the perfect typeface that’s also free is a bit like searching for the Holy Grail,” commented Martha Stewart Weddings. They recommend checking out dafont.com and abstractfonts.com for free or donation-based styles. Lea Armstrong of WeddingPaperDivas.com told Martha Stewart Weddings that thermography can be an affordable alternative to engraving. While the methods differ, Armstrong assured that the look of raised ink is almost identical. The price of printing? You can cut it in half. “Find a graphic designer to design your stationery and send you high-res PDFs that you can print and assemble yourself for invitations, table numbers, and favor tags,” suggested wedding planner McNall. Not sure how to find a designer? Check Etsy: most printable suites cost under $100 if you request minimal edits. Dreading buying stamps for your invitations, response cards and thank yous? Go digital by checking out services like Paperless Post or Greenvelope. “Tools include RSVP and plus-one tracking, open rate management, registry announcement, wedding website link inclusion, photo sharing, survey questions to collect meal preferences, allergies or song requests,” noted Amanda Arrigotti of Greenvelope.com. The U.S. Postal Service hates square envelopes. OK, we don’t know that for sure, but we do know that square envelopes require more postage than the standard rectangle — each one is subject to a 21-cent fee on top of the cost of the stamp. Those cents add up quickly! “Sheets of tissue between layers of invitation packages were used in the past to prevent ink smudging,” explained Carolyn Garin and Kathleen Hughes of The Anti-Bride Etiquette Guide. Use a postcard for each guest’s response instead of a card with an envelope. “The cost to print these is about the same as an enclosure and envelope, [but] the big savings is in the postage,” author Lenderman remarked. Services like The Knot and eWedding offer free wedding websites where you can list accommodation options, directions and a link to your registry. List your wedding website on your invitation or an accompanying note, and you’ll be able to skip a few of those extra cards people usually lose from invitation packets. How do you find a newbie who has the skills of a pro? Katie found hers through friends’ recent wedding photos on Facebook. Remember to ask friends for referrals! Photographer Dorie Hagler advised against hiring a studio that seems too inexpensive to be true. Hagler knows — she’s one of them. Many photographers offer an assistant “second shooter” in their standard contracts, but others offer it as an option and charge extra. If you’re expecting fewer than 100 guests, you can get away with having only one photographer present. Many photographers offer hourly blocks to fit all sorts of occasions. If you can only afford your top-pick photographer for a few hours, Hagler said to organize your event so you cut the cake (or arrange other special moments) in that time frame. Don’t pay for a pricy album if you can avoid it. “If you get the digital photos, you can make prints of your favorites,” said Lou Lomibao of SnapKnot. If you decide later that you’d like a digital album, you can create one that fits your budget at that time. Are you OK with guests using their varied electronic devices at your celebration? Want to capture big moments, but don’t want to pay big bucks for a wedding video? Invite your guests to contribute video through a site like WeddingMix. You’ll be able to piece together your big day (or have a pro do it for you) with a bit of home-movie style. You can capture fun, informal photos of friends and family without renting a photo booth. Set up a simple backdrop and provide some fun props. Guests can use their phones or personal cameras and snap away. You’ll likely be able to enjoy all the shots later on social media! If you’re using a wedding hashtag, you can pick and choose Instagram snaps to have compiled into photo books by companies like Blurb. “If you are getting married outdoors, let the scenery do the work for you,” encouraged wedding planner Lutkus. Buy off-season decor items if you have enough time. When planning centerpieces, “Have some [tables] with “wow” pieces and some with something smaller that costs much less,” recommended Anthony Navarro, founder of Liven it Up Events in Chicago. You’ll catch your attendees’ eyes with carefully placed centerpieces. Photographer Hagler prefers smaller centerpieces. Towering features tend to cost more, “and they get in the way of taking photos,” she said. “Instead of doing big centerpieces, find some really interesting larger things to take up space overhead,” suggested Florida bride Katie S.
She chose paper lanterns for her reception space, accented by mobiles made out of bunches of origami paper cranes. “Our total cost for flowers and decor was $300,” she said. Katie stocked up on metallic paper by visiting her local chain stationery store after the holiday season. Author Lenderman recommends moving pew or aisle markers from your ceremony to double as centerpieces at the reception. Another idea is to reuse your bouquets. 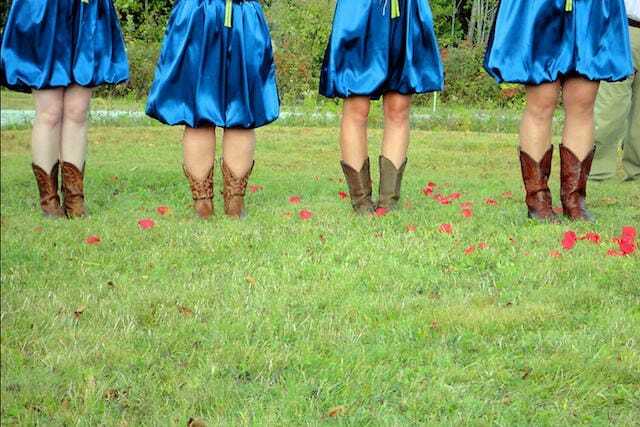 “After the ceremony at my friends’ wedding, the bridesmaids simply popped their flowers into vases waiting on each table. The centerpieces were super simple, but looked gorgeous,” says The Penny Hoarder senior editor Heather van der Hoop. “If you love specialty linens but can’t afford them for all of your tables, just use them for your head table and cake table,” recommended Tampa-based wedding planner Tracie Domino. These tables will be the most prominent during your celebration — and will probably be photographed the most. “Check out listings and post your own request on Kijiji or Craigslist,” wedding planner McNall recommended. Once-used linens and decor can often be found for prices that beat the cost of renting. If you’re concerned about making back the bucks you spent on new decor, wedding planner Jennifer Taylor from Seattle says to skip it and rent decorations. “If you pick one kind of flower instead of pricey arrangements, you can get many more flowers for a lower price,” Jessica Probus noted on Buzzfeed. Bonus: You’ll need fewer of your favorite large blooms to make a statement. Wedding publications can drive an interest in a trendy flower like a peony. Wedding planner McNall recommended exploring vendors who work in events, but aren’t always swamped with weddings. “I often use a talented florist in town whose bread and butter is corporate work, so she doesn’t upcharge her wedding work like some florists do,” she said. “I visited two florists before making a decision,” Jane Bianchi shared at LearnVest, explaining that she liked the first option much more but couldn’t bear the much higher price estimate. Bianchi’s preferred florist matched the price, proving the power of negotiation. Lucia H. of New York City rented orchid plants for her big day. “We arranged them in baskets instead of buying flowers that would later die.” Afterward, they returned the exotic blooms to the florist for resale. “Grab your girlfriends and head to a wholesaler,” recommended D’Antonio of Weddington Way. “I planted an insane number of huge pots of annuals that would last the entire summer and fall season,” offered bride Kelly Fallis from Ontario. “Paper flowers are an inexpensive alternative to real ones,” said Buzzfeed writer Probus. With a little practice, you can DIY these. If you’d rather save some time, paper blooms start at about 50 cents each on Etsy. It’s wise to even save coupons that have expired, as some stores will still honor them. Swoon California event planners Jennifer Arreguin and Natasha Burton advise planning out the pricing of DIY projects before you purchase supplies. If you’ve ever traveled to an out-of-town wedding, you’ve probably been greeted with a bag at the hotel that contains snacks and local guides. You can still tell your guests about your favorite places without spending the money on supplies or the time on assembly. Drop markers on a Google map that you can share with guests, or create a local scavenger hunt through the Stray Boots app. Lutkus is a minimalistic wedding planner (she suggested skipping save-the-date cards and decorations, too), and I love it. If you really want to provide favors, have them offer a dual purpose: bubbles to blow at the ceremony and something personalized to eat at the reception or save for later are two Lutkus-approved favors. “Wedding favors are often more stressful than they are useful,” Probus shared on Buzzfeed. Instead, she suggested inviting guests to take home centerpieces or decorations. “They’ll get a great home decor item and you won’t have to worry about what to do with 15 mason jars filled with flowers,” she wrote. “You don’t need to have programs, save-the-date cards, welcome bags, or favors at your wedding,” event planners Arreguin and Burton admit. If you’re thinking of wearing a vintage or secondhand gown, you’re in luck. Beyond vintage shops (some of which focus solely on wedding gear), some regions now feature bridal shops that only offer pre-worn gowns. You might need to spend more on tailoring, but the up-front savings will likely offset that cost. Grooms, maybe you can track down a fly vintage tux? Want a super-simple dress? Event planner Patires said to look at bridesmaid dresses in white or ivory shades. Event planners Arreguin and Burton encourage renting a gown through a website like Rent the Runway. It is sort of a wedding rule, after all. “Before you purchase something, think about weddings that you’ve been to recently,” bride Jane Bianchi wrote. A bride might even be honored if you ask to borrow her veil, shoes, jewelry or shawl — and you’ll cut those costs completely. On “Say Yes to the Dress,” they call it “jacking up” to help a bride see what she’ll look like in a dress, veil, sash — the whole deal. Grace Caiazzo, owner of Bella Bridal and Heirlooms, explained that this technique can help bridal associates can increase their commission, but brides can also find themselves with a larger bill! “I recommend trying on different styles, then going home and searching the internet for the best price on the style you like best,” she said. “There is no way to tell the difference between mid-priced veil and a high-end designer veil,” wedding planner Domino noted. Since you’ll likely only wear your veil during the ceremony, save a bundle by choosing an inexpensive style. Just because it’s your big day doesn’t mean you have to wear everything fresh out of the box. Check your closet for a pair of shoes that would pair well with your dress, or wear your favorite bold heels. If you’re wearing a long dress, your feet won’t have a starring role anyway. Bianchi wrote that she waited out the best deal on beautiful wedding shoes. “If you can, hold out for big holiday sales around Memorial Day, July 4th, and Labor day,” she said. And while you’re online window shopping, check your local bridal salons for their sample sale dates. Washington, D.C. groom Mike C. and his future husband are planning to look sharp on their big day. “We’re buying custom suits,” he said. “No tuxes. No rentals. Good investment. And not tacky!” They’ll be able to wear those suits for as long as they fit. Want the formality of a tuxedo without the price tag? “Consider asking friends and family members if they have a tux that you can borrow,” recommended Casey Slide at Money Crashers. “Couples are spending an average of $1,500 on their wedding rings,” Vincent La Rosa of Tungsten World said. He explained that alternative-metal rings can be much less expensive than traditional white gold, while also often being more durable. “We asked our friends and family to donate their old gold to an environmentally friendly jeweler,” blogger Sarah Cotner told LearnVest. After melting down the old goal, Cotner received a credit to have new rings created from the molten metal. Her cost for two wedding bands: $109. “Today’s costume jewelry looks remarkably real,” noted bridal boutique owner Caiazzo. Instead of real diamonds or pearls, costume pieces can add a dash of glamour at a modest cost. “No one will guess that the jewelry isn’t real,” she said. “When choosing jewelry for the bride (and possibly bridesmaids), go with designs that are easy and wearable beyond the wedding day,” recommended Megan Reynolds of Flawed Perfection Jewelry. You’ll get more use out of pieces that you can wear with other outfits or in a variety of venues. Don’t feel pressured to have a classroom-sized wedding party. Keeping it small or skipping attendants altogether can offer major cost savings, said event planners Arreguin and Burton. Need to transport your bridal party or family? Ask limousine, trolley, or bus companies if they offer rates by the hour or by the day. By comparing different kinds of estimates “apples to apples,” you can determine the best option for you. Looking for a more subdued method of transport? Contact sedan companies that specialize in corporate transportation. They may be willing to contract out a few Lincoln Town Cars for your big day. Only need to go a short distance with your group? One very effective (and frugal) gift is to give personally important books to each person. Choose one that expresses something personal that you feel is appropriate for each member of the wedding party and hand-write an inscription on the inside, noting that the gift is for the wedding and why it’s an appropriate book. Whether you order brand-new copies from Amazon or give your own well-thumbed copy of a favorite book, your gift is sure to resonate with each of your friends. Marketing coordinator and event planner Farrell used her planning savvy for her own wedding day. “My bridesmaids found their dresses at a variety of places, including David’s Bridal, eBay and Tradesy,” she said. Farrell requested a specific color, but allowing bridesmaids to choose their style helped each woman stick to her own comfortable budget. Makeup artist Rosemary Redlin shared this smart tip with Martha Stewart Weddings: Hire the best makeup person you can afford, but ask them to leave a touch-up kit for you. Since most artists charge by the hour, you don’t want to pay for someone to wait around to do a five-minute touch-up before your portraits. The cocktail hour typically allows time for wedding party and family portraits. If you’re having all your wedding activities in one location, and/or will have your photos done before the ceremony, you may be able to skip that extra hour of service altogether. Thinking of having a buffet? Ask to use seven-inch plates rather than the standard 10-inch dinner plates. “Guests tend to put less food on smaller plates and will likely consume what’s only on their plate,” noted Greg Jenkins of Bravo Productions in Long Beach, California. Ask your caterer or venue if meals can be served family style. Marcey Brownstein, a New York City-based planner, told Martha Stewart Weddings that family-style serving makes the food a focal point as well as a way to start conversation. It also allows you to serve a few less-expensive dishes, like pasta, that you might not expect at a traditional plated dinner. Inviting kids to your celebration? Meghan Ely of the Richmond Bridal Association recommended asking your caterer if kids’ plates are available. “[Kids will] appreciate the chicken fingers,” she told the MintLife blog. Event planner Jenkins said that most venues won’t propose this to a bride, but it’s worth asking if you can purchase food on consumption. With this model, you pay for what’s eaten, rather than how many guests attend. “Review the big picture and put your dollars into what is really important,” said Jenkins. “If your venue allows you to bring in your own food, that’s an opportunity to save huge,” event planner Farrell said. You’ll get to share your favorite local spot with your guests while potentially saving a big chunk of change. “Lately, we’ve been seeing an increase in requests from brides and grooms looking to find ways to save money on food and beverage … while still providing their guests with a unique experience,” said Alexis Evans of Roaming Hunger. Buzzfeed writer Probus warned that liquor can really eat up your wedding budget. Plus, it’s a great excuse for you and your sweetie to play mixologist at home to test out cocktail recipes! Determined to have an open bar? Save a bit by asking bartenders to ban shots. “Eliminating that option helps keep down the added costs of late-night trips to the bar,” Ely told MintLife. Here’s another way to save while still offering an open bar. Capital-C Champagne hails from that specific region in France, and comes with a price tag to match. Consider switching out the fancy stuff with cava or prosecco. You can save $20 per bottle or more, according to an expert for Martha Stewart Weddings. Have your heart set on real Champagne? Jenkins offers this cost-saving compromise: Offer a one-glass Champagne toast instead of having the bubbly flowing all night. “A neat way to have the wedding cake of your dreams within your budget is to use dummy layers to minimize the amount of cake that’s actually required,” explained Nodlaigh Spillane of Daydreaming Bride. For instance, your baker could make a four-tier cake with two fake tiers of polystyrene that cost just a few dollars each. Once frosted, they look the same as the rest of the cake. “You very rarely see all the wedding cake eaten anyway, so this would reduce waste as well as the costs of your super stylish cake,” she said. It might sound counterintuitive, but this is a smart savings strategy. “Order a small decorative cake for the cake-cutting ceremony,” advised Stacey León of Butterfly Bakeshop in New York. “And have a sheet cake in the back that can be cut for serving guests.” You’ll save big on decorating labor. Don’t let those slices go to waste. “Instead of serving each person a slice of cake, have your caterer set up a buffet-style table where plated slices can be placed,” said León. By letting guests serve themselves, only those who truly want to enjoy dessert will take a slice. And in doing so, you’ll be able to order less cake. “Order a plain base cake with colorful trim and then have your florist add fresh flowers on site,” recommended León. Most florists have extra flowers on hand after decorating, so discuss this option with your floral provider. “My girlfriend did pies,” recent Pennsylvania bride Jen H. recalled. “She actually had a bunch of family and friends make two apiece and bring them. There were about 15 pies.” That sounds delicious. “We ordered an assortment of cupcakes with white frosting instead of ‘wedding’ cupcakes,” said bride Katie S.
“Load up your iPod with playlists for each part of your wedding, and designate a friend or family member to grab the mic during special announcements and monitor the music,” recommended D’Antonio. You’ll get to hear all of your favorite songs on your wedding day without risking a DJ making tacky jokes. Be sure to ask your venue about hookup equipment, speakers and the like. “We had two other friends who are talented singer-songwriters, and they agreed to play music for free during the ceremony,” bride Bianchi shared on LearnVest. Even after providing gifts for her performers, Bianchi estimated saving $750 on this aspect alone. Probus suggested contacting your local college’s music department to ask about students who play at events. “They cost less than professional musicians and are often eager for the experience,” she wrote. Lisa Rowan is a former staff writer. 4 Hours Ago Dear Penny: I Can Only Afford Interest on My Student Loans. What Can I Do?